Hong Kong's property market is now cooling rapidly, amidst the introduction of new market cooling measures, rising interest rates as well as slowing economic growth. Demand is now falling. House price rises are decelerating sharply. Over the past decade, Hong Kong's residential property prices have skyrocketed by 242% (152.6% inflation-adjusted), including spectacular growth of 28.5% in 2009, 21% in 2010, and 25.7% in 2012. In contrast, real incomes have virtually stagnated in Hong Kong for years. So is the big crash coming up? Hong Kong's residential property price index rose by just 1.62% during 2018, sharply down from the prior year's 14.74% growth, according to the Ratings and Valuation Department (RVD). In fact when adjusted for inflation, residential property prices actually declined 0.92% y-o-y in 2018. During the latest quarter, prices plunged 7.96% (-8.73% inflation-adjusted) in Q4 2018. Apartments smaller than 40 sq. m: prices rose by 4.93% y-o-y to HK$172,661 (US$22,000) per sq. m.
40-69.9 sq. m. apartments: prices rose by 1.74% y-o-y to HK$173,070 (US$22,052) per sq. m.
70-99.9 sq. m. apartments: prices fell by 1.25% y-o-y to HK$197,957 (US$25,223) per sq. m.
100-159.9 sq. 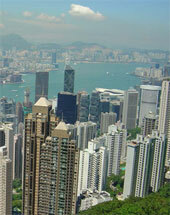 m. apartments: prices fell by 11.8% y-o-y to HK211,974 (US$27,009) per sq. m.
Demand is now falling. During 2018, the total number of property transactions in Hong Kong dropped 7.1% to 57,247 units from a year earlier while sales values increased a meagre 0.5% to HK$559.29 billion (US$71.25 billion), according to the RVD. Residential construction continues to rise. In 2018, completions rose 18% to 20,968 units from the previous year, after y-o-y rises of 22% in 2017 and 29% in 2016. From 2008 to 2013, house prices skyrocketed by 134% (95.7% inflation-adjusted), driven by a flood of money in the wake of the global financial crisis. The market slowed in the first half of 2014, with house prices rising only by 2.9%, due to government cooling measures. But the housing market bounced back quickly in the second half of 2014, with prices rising by 13.6% in Q4 2014, 19.6% in Q1 2015, 20.4% in Q2 2015, and 15% in Q3 2015. After a brief housing market slowdown from Q4 2015 to Q3 2016 amidst Hong Kong's economic slowdown and decline in tourist arrivals, house prices recovered rapidly by end-2016, and have been accelerating since. “Prices have already corrected 8% from the recent peak in August 2018 due to macro uncertainties and several events occurring in the property market that concerned investors,” HSBC analysts said. HSBC predicts price falls of around 5% to 10%. This was supported by Colliers in its Q4 quarterly report: “A subdued stock market, rising interest rates, increasing loan rations and a slower economic outlook for 2019 all suggest residential prices will slide further in 2019. Hong Kong's economy grew by just about 1.5% y-o-y in Q4 2018, the weakest growth since Q1 2016, amidst the US-China trade conflicts. Overall, HK's economy expanded by about 3% in 2018, easing from a six-year high of 3.8% growth in 2017, according to Finance Secretary Paul Chan. The HK economy is expected to expand between 2% and 3% this year. Hong Kong's property market is in a select band of cities where gross rental yields - the percentage return to owners on renting out their property - is only just above 2%. This is due to the continuous rise in Hong Kong's residential property prices. Effectively, this means that landlords are unlikely to make any profit on their apartments, once empties, administration costs, cleaning and repairs, and other costs are taken into account. Or, if not nothing, then very little. Other such cities are Monaco and Taipei. That's not to say rents are low. You will pay US$7,000 per month for a 120 square metre (sq. m.) apartment in Mid Levels. But if you want to buy it, it is likely to cost you USD 3.7 million. Hong Kong is not a ‘typical’ market. How could it be, when Hong Kong is the 2nd most expensive city in the world in which to buy a home? It is a place where the rich choose to park assets in the form of apartments, as part of a diversified asset-safeguard strategy - like Monaco and Singapore. Such markets typically have lower rental yields than more ‘normal’ housing markets. Round trip transaction costs are high for foreign buyers in Hong Kong (though the surcharge is unlikely to be permanent). See our Property transaction costs analysis for Hong Kong and Property transaction costs in Hong Kong, compared to the rest of Asia. Rental Income: Net property income is taxed at 15% (previously 16%). Net income is computed by deducting a standard 20% for repairs and outgoings from the assessable value (gross rent less irrecoverable rent and rates paid by owners). Capital Gains: No capital gains tax exists in Hong Kong. Inheritance: Inheritance tax or estate duty was abolished from 11 February 2006. Residents: Taxation in Hong Kong is based on the territorial source principle; i.e., where the income was earned. Income derived from outside Hong Kong is not taxed in Hong Kong. The total roundtrip transactions costs of buying and selling an apartment are high. There is a special stamp duty (SSD) at varying rates, from 5% to 20%, depending on the holding period of the residential property. Property held for longer than 36 months will not be subject to SSD. There is also buyer’s stamp duty BSD) at a flat rate of 15% on all residential properties acquired as of 27 October 2012. Landlords have an easy life in Hong Kong. Rents: Rents can be freely negotiated in the private sector, which comprises about half of the rental market. Tenant Security: The Landlord and Tenant (Consolidation) Ordinance 2004 removed security of tenure, i.e. domestic tenants no longer have the statutory rights to renew their tenancy at prevailing market rates. Hong Kong’s economy expanded by about 3% in 2018, easing from a six-year high of 3.8% growth in 2017, according to Finance Secretary Paul Chan. The HK economy is expected to expand between 2% and 3% this year, amidst cloudy global outlook, according to Chan. Tourism is surging. Visitor arrivals reached a record high of about 65.1 million in 2018, up 11.4% from a year earlier, according to Hong Kong Tourism Board. Mainland Chinese, who accounted for about 78% of arrivals in Hong Kong, increased 14.8% y-o-y to 51 million people. In January 2019, inflation was 2.4%, up from 1.7% in the same period last year, according to the Census and Statistics Department. Hong Kong’s inflation rate averaged 3.4% from 2011 to 2018. Hong Kong’s jobless rate remains low. Unemployment was 2.8% in Q4 2018, slightly down from the previous year’s 2.9%, according to the Census and Statistics Department. Hong Kong’s unemployment rate averaged 3.4% from 2010 to 2017, down from an average of 5.5% from 2000 to 2009, according to the IMF.